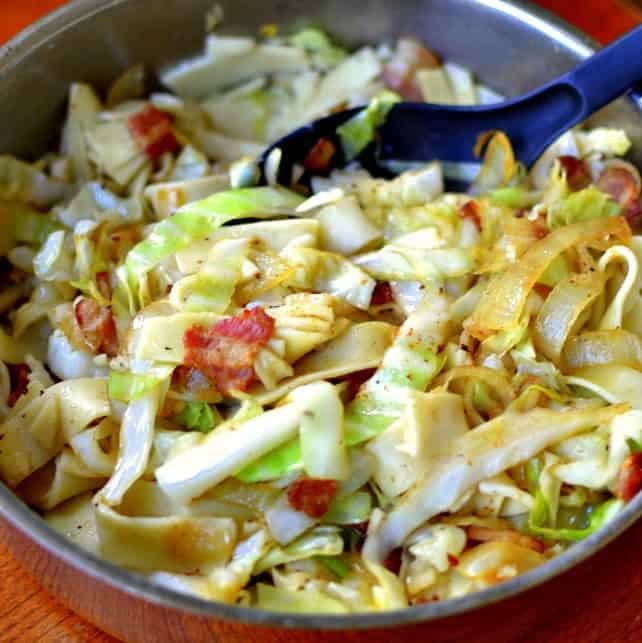 This fantastically simple Haluski combines bacon, cabbage, egg noodles, garlic and seasonings into a delectable taste treat. It comes together so quickly and is simple enough for novice cooks. Haluski is delicious, easy and quick making it one of our family favorites. I love Haluski. I mean really who doesn’t? 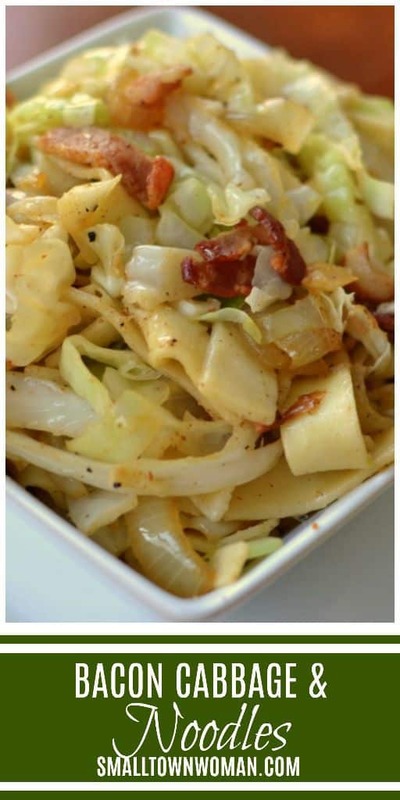 This noodles and cabbage dish is commonly referred to as Haluski. Haluski is a Noodles and Cabbage dish of Polish and Slovakian origin although there is some disagreement from the Ukrainians and Hungarians. No matter where it originated from it is delicious comfort food. It is sure to be a hit with your family and friends. Now I don’t think that the original version had bacon in it but you know me well. 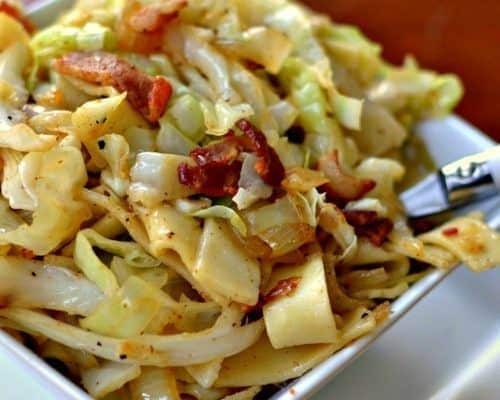 Savory Bacon Cabbage and Noodles is my delicious modified version of Haluski! First cook the egg noodles according to package directions and drain well. In a small bag or bowl combine paprika, onion powder, oregano, salt, black pepper and cayenne pepper. Cook the bacon in the skillet until it is almost completely browned. Add the onion and cook for an additional couple of minutes. Add the cabbage and cook until it is tender. All the garlic needs is about a minute to cook so add that just before the cabbage is done. Then sprinkle the cabbage with the seasoning that you mixed. Finally add the cooked noodles to the dish and stir gently to combine. Helpful hints on making this Haluski epic. Use the Amish style egg noodles because they are thicker, sturdier and delicious. Don’t overcook the noodles because you don’t want them breaking apart. Consequently they will be reheated for about 2-3 minutes at the end of the recipe when they co-mingle with the cabbage. Get your bacon crispy as crispy bacon tastes better and holds up better in this dish. 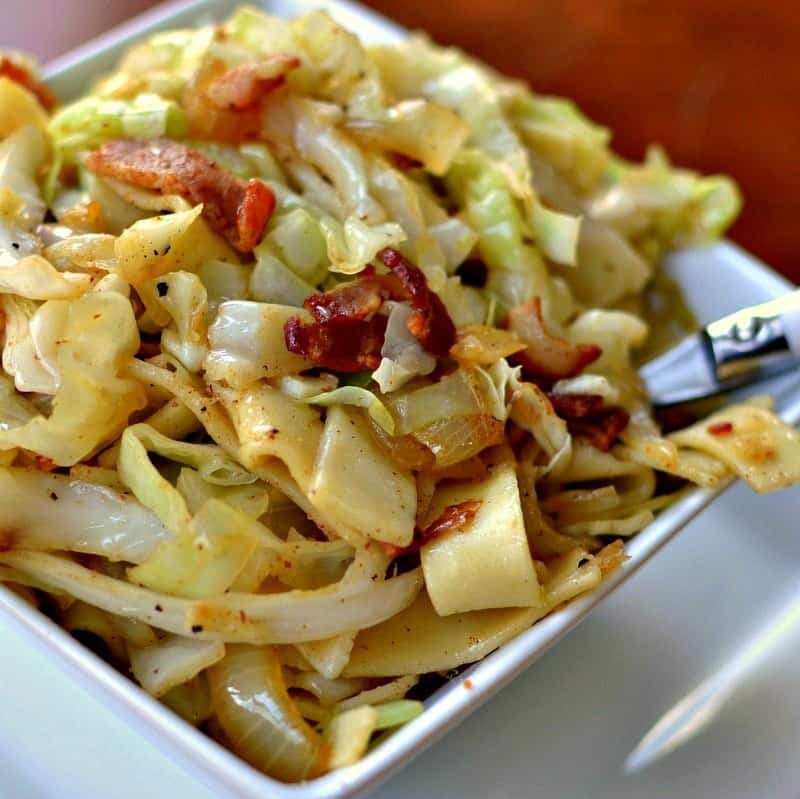 Slice your cabbage and onions thin hence it cooks faster and the whole dish appears better. If you have a sensitive palate and the idea of adding any cayenne panics you then for goodness sake don’t add it. The dish will still be delicious with or without it. As I always say don’t throw the baby out with the bath water. This dish is best as soon as it is cooked. I have had it sit for a bit and it still tastes good. But right out of the pan upon completion is phenomenal. If you are looking for a heartier meal then add thin sliced pieces of kielbasa sausage at the same time that you add the onions. Health benefits to eating cabbage. Cabbage is healthy! Therefore don’t wait for St. Patrick’s Day to bring home that cabbage. Cabbage is delicious and it has numerous health benefits. Cabbage is an excellent source of vitamin K, vitamin C and vitamin B6. It is also a very good source of manganese, dietary fiber, potassium, vitamin B1, folate and copper. So if you haven’t had any cabbage lately, the only one you can remember is the boiled one, then you need to branch out. Live a little. Enjoy your new adventure! This post was originally published January 3, 2017. It was republished June 6, 2018 with new relevant information and new pictures. 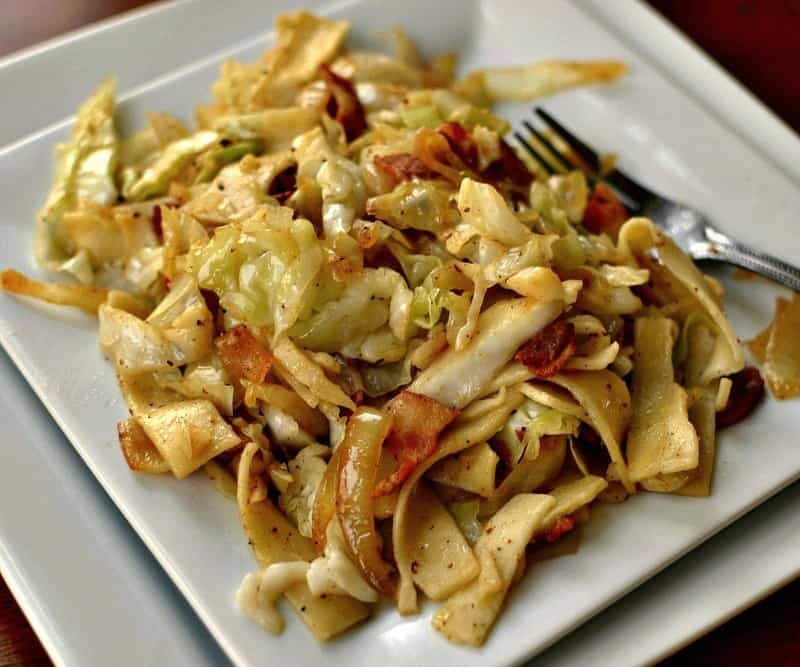 This fantastically simple Haluski combines bacon, cabbage, egg noodles, garlic and seasonings into a delectable taste treat. Cook egg noodles according to package instructions. Drain well. In large skillet add bacon and cook until almost completely browned. Add onions and cook for additional 2-3 minutes. Add cabbage and cook until it is tender; approximately 10 minutes. Add garlic and cook for additional 1 minute. Sprinkle with seasoning. Add egg noodles and stir to combine. I love topping Haluski with a spoonful of sour cream. Delicious. I will have to try that! Thanks for the heads up! When adding the cabbage, does it need any liquid or is the fat from the bacon enough? Are Amish noodles in the frozen section? Thanks! The fat from the bacon will do the trick. Amish noodles are with the other dried pasta like spaghetti and penne. Thanks for the heads up! Sounds delicious! My late Mother was Polish and never mentioned this recipe to me . I found the Amish noodles , extra wide , at WalMart today. Can’t wait to have this over the weekend and may add a thinly sliced fresh red pepper just for color . I think I was deprived as a child not to have had this! Thanks for a great recipe!! You are most welcome! I sure hope you enjoy it. We love it! I made this with regular egg noodles, which I had. I’ve never noticed Amish noodles before. I suspect it’s a regional thing. It was very easy to make and quite delicious. I included the cayenne and actually think it could use a little more. It wasn’t spicy. I will mention I had a bite or two where the cabbage was a little bitter. I believe that was the core or heart, so stay away from that. I’ll definitely fix again oh yes, I diced some leilbasa sausage- maybe a 1/2 cup. It could have used more. Thanks Brenda! Maybe Amish noodles are a regional thing! The sausage is a delicious addition. Where is the sour cream? Interesting! I have never heard of sour cream on Haluski! What a great recipe! We love this dish! Have always loved the bacon and cabbage combo, sounds great! Haven’t had this in forever and we adore it, this is such a good recipe! Thanks so much Alli! I hope you enjoy it! This totally reminds me of my Grandmother’s recipe. It’s always a family favorite and nice way to remember her. My mom decided to throw all these ingredients together because she didnt know to cook. It’s one of my favorite dishes. I guess if your ancestors come from the Ukraine, you automatically like the same things. Looks so yummy! Great flavor!